Focus was founded by former pro mountain bike rider and cyclocross champion Mike Kluge in 1992, and in 1993 he partnered up with German bicycle manufacturer Derby Cycle Werke to produce the level of quality he wanted in the numbers he expected. Flash-forward to 2018; while still producing a variety of pedal bikes, Focus has a growing number of e-bikes, notably giving them even more prestige on the company’s website. Focus uses the “squared” moniker to designate their e-bikes, and they make squared versions to match the ride quality of their regular bikes. Have they succeeded? We think they have. Focus has updated the Jam² with some new features and options, most notably a carbon version and this 29er. The bike features their unique two-battery system for versatility and range options, and an integrated Di2 shifting system. It’s a good-looking bike designed for all-mountain riding. The head tube angle is a mellow 66.5 degrees and the rear triangle is a long 470mm chainstay length, which is great for preventing loop-outs on steep climbs. Rear suspension is provided by Focus’ F.O.L.D. system, which stands for Focus Optimized Linkage Design. The travel is designed into two phases. In the first 30 degrees, it works digressively for super-sensitivity. This eliminates micro-bumps and creates immense grip. The second phase of the suspension offers fine-tuned progression that offers a plush feel and feedback while offering resistance against bottoming out. The main part of the triangle is one piece to save weight and doesn’t require any bearings. The Mineral Green finish looks great and stands out, and there are vents at the top of the downtube to allow air to circulate around the battery. The Reverb dropper offers pretty long travel to allow you to climb all over the bike when you want to. The powerplant for this bike is Shimano’s STEPS E8000. With its small size and weight, big power is delivered almost seamlessly to your own pedaling efforts, and we’ve become big fans of this motor. It has a narrow Q-factor, and it’s been reliable in every bike we’ve ridden with it so far. What sets the Jam² apart from everyone else’s bikes is the battery system. What Focus has done is to create something very innovative—a two-battery system that relies on an internal 378-watt-hour battery built into the oversized downtube. For shorter rides, this is all you need, and it keeps the look of the bike very clean and saves 4.9 pounds by not carrying a single, larger battery. Vents on the side of the frame allow air to flow through and keep the battery cool. For longer rides, they’ve developed an external 378-watt-hour battery that slides on to a proprietary mount system on the top of the downtube. When you aren’t using it, you can also mount a bottle cage, which is included. Interestingly, both batteries won’t work at once. There’s a cable that connects the external battery to the system. When connected, it uses the external battery. When not connected, it uses the internal battery. The internal battery is charged through this same port, the external battery has its own charge port. An extra charger would halve your charging time for both. The small display is well-protected in case you go down. It’s easy to read and has just the info you need—speed, power level, battery level and a graph of the motor’s power output level. The E8000 display is tiny and bright, mounted on the handlebars in a way that protects it from crash damage. The design of the information on the display shows current speed, power level and a graph of the current motor power output. There’s a button to engage Walk mode for those times you have to walk up a section, and the bike can carry its own weight. The three levels of power output are Eco, Trail and Boost. The stock setting feels like Eco is 10 percent, Trail is 25 percent and Boost is 100 percent. We think there’s too much disparity between Trail and Boost straight out of the box. Fortunately, Shimano provides their E-Tube app to connect to the system and change power settings to your own preferences. We bumped Trail up closer to the middle. With that, Eco is often good for flat ground, Trail for climbs and Boost for the steepest of climbs. The E8000 motor is fairly quiet, has a great Q-factor and delivers power with a very natural feel. The Jam² is for serious all-mountain riders who want a plush ride with plenty of power and range with the option to only use one smaller internal battery to save weight or use two for extended range. It’s important to note that when you first climb aboard the Jam², you have to turn the system on before pedaling the bike. With the STEPS E8000, while the sensors all zero out, you can’t touch the pedals—at all. Any pressure on the pedals or movement will result in an error message, and you’ll have to turn the system off and on again to get it to work. The external battery, bottle-cage mounting bracket and related goodies come in a nice hard-side, padded case. The Shimano Di2 drivetrain is powered by the internal battery, so you don’t have to worry about a separate charging setup or using Shimano’s proprietary cable that’s easy to lose. The disadvantage to this is that you can’t ride the bike around with the system off and still shift gears. We spoke to Focus, and they’re looking into that. It might mean that the Di2 would have to be live all the time, but it draws so little power that this may not be an issue. When shifting, you can have it set to beep with every shift, or just when you hit the upper or lower limit. There are quite a few options you can access through the internal menu, and even more with the app. The suspension on the Jam² is amazing. Our test riders loved it, saying that it helps the bike track like a regular mountain bike and feels well-balanced and planted with the low center of gravity, even with the extra battery mounted. It is tuned for hard-core riding and responded well to any level of assistance. You don’t have to play with it, leave it open and just ride. The 29×2.4-inch Continental Trail King tires had grip for days. They’re on 30mm-wide Race Face Aeffect wheels, and one test rider even commented that he’d prefer an even wider rim to make the tires grip even better. The Rosenberger plug underneath the top tube is for charging the internal battery and to connect the external battery when in use. That channel leads back to a second plug that isn’t live but holds the cable in place when you’re not using the external battery. The Reverb dropper worked really well. It kept the seat way out of the way when you needed extra room to move. One word of warning: if you lift the bike by the seat, such as to load it onto a rack, you can introduce air into the chamber of the dropper and that can cause it to not work well. On a long ride (well over 40 miles), one test rider ran out of battery. The motor shut off, but thankfully the Di2 had enough juice to get him another five miles. He didn’t know how much longer it would continue shifting after that, but at least it got him home. We had so much fun on this thing, we collectively put a lot of miles on it. It tracks like a dream and the suspension is fantastic. Not only is this a lot of bike for the money, it’s also one of the better-riding bikes we’ve tested. 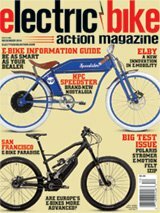 No doubt that Focus’ legacy of performance mountain bike designs has seeped into the e-bike program. Other than our preferring a way to operate the Di2 without having to turn the battery on, the Focus was a lot of fun, and you have choices of two-wheel sizes. If you want more travel, the Jam² offers 170mm of travel. In addition to the aluminum frame, if your wallet runs deeper still, there’s also a carbon version that shaves about over 2 pounds off the bike.